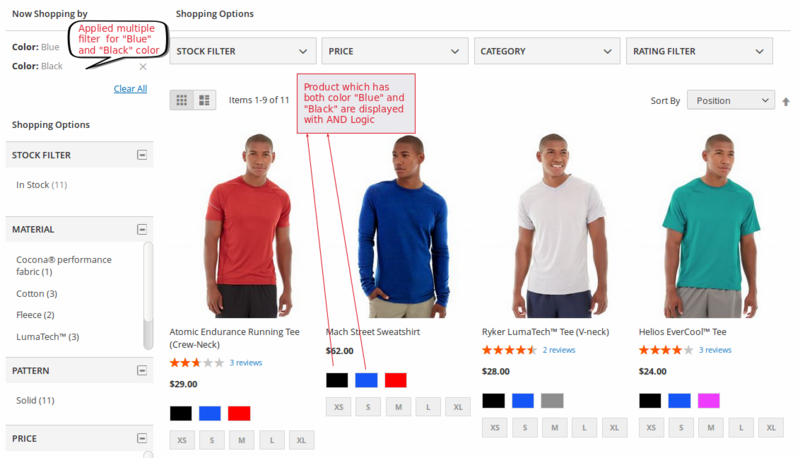 100% Ajax based Magento 2 Layered Navigation Filters. Display Layered Navigation in Sidebar , Top and Both Layout..
Search Engine Optimized Filter section with SEO Friendly URL support. 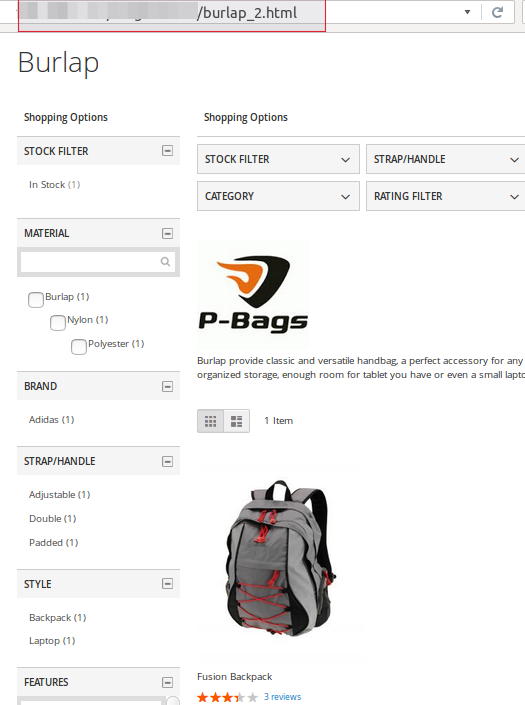 Shop by Brands Filters with separate Brand Slider option to showcase Brands on Home Page and inners pages. 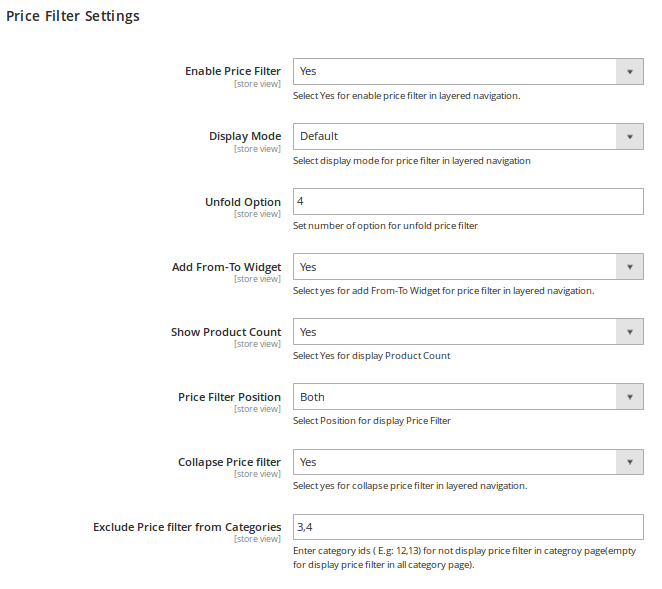 Custom Rating Filter, Stock Filter, Price Filter with From-To widget option for Price Filter, this can be set in any display mode. 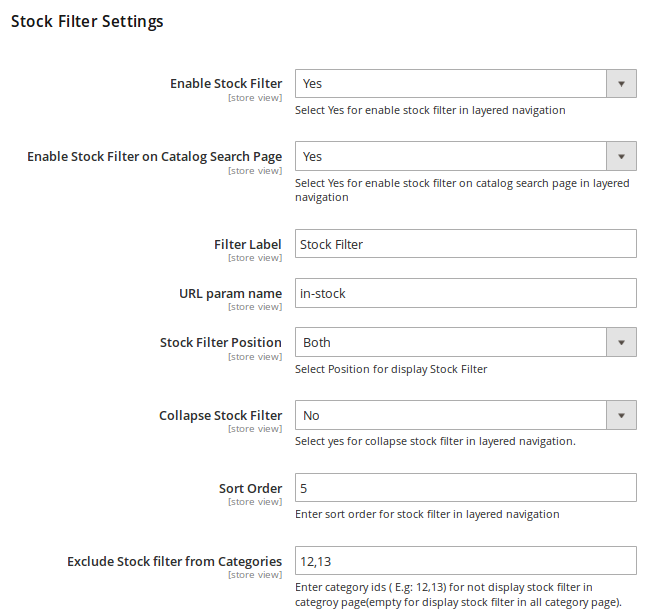 Filters with numerous options are configured with fixed height to save vertical space. 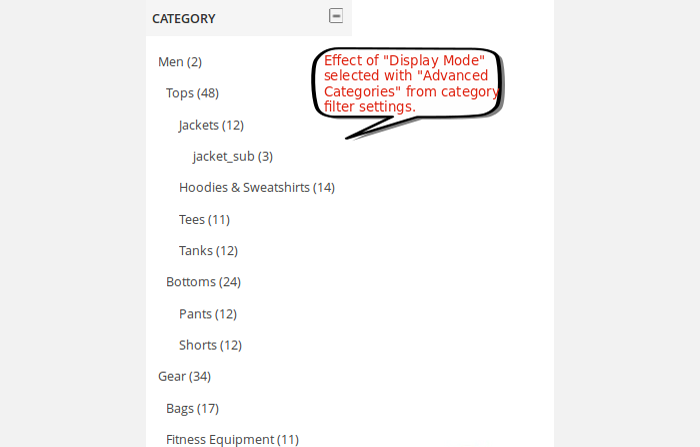 Restrict attributes visibility on certain category pages. Filter can be shown as Simple Links/Checkboxes/Radio buttons. 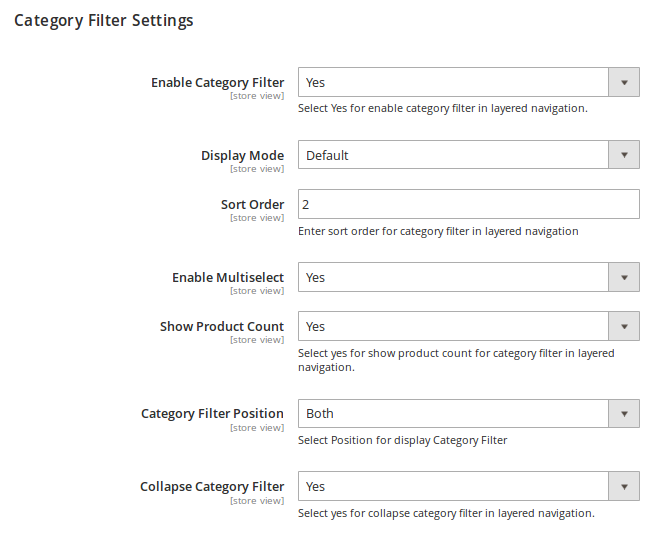 You can apply AND logic to multiple selections of attribute filter. 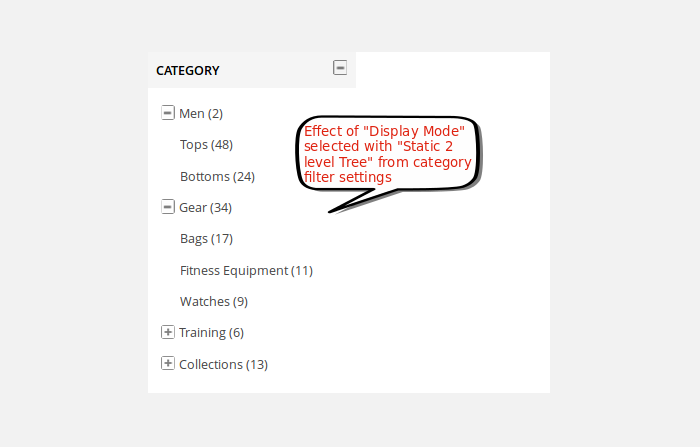 Display Top filters in Horizontal Drop down Menu Style or Horizontal Boxes. 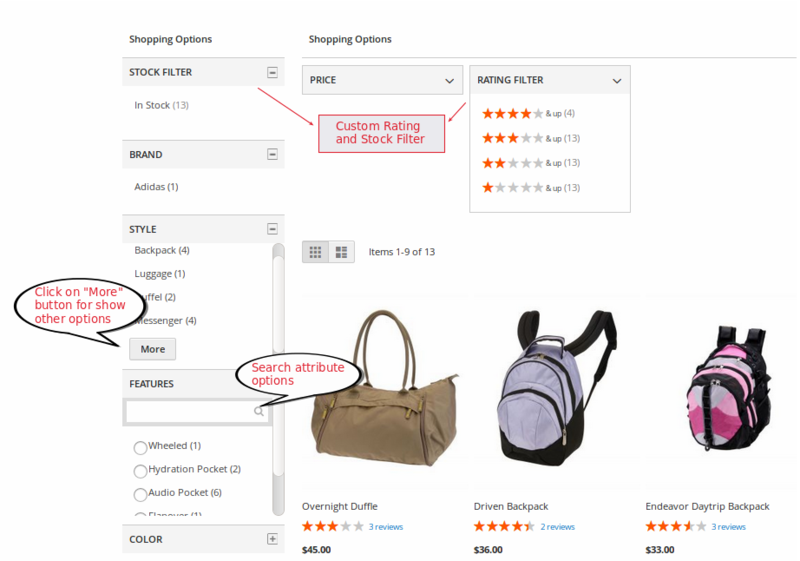 Magento 2 Layered Navigation Pro extension has greatly expanded filtering options for make layer navigation more flexible and much more user-friendly.You can apply multiple options of the same attribute. Magento 2 Ajax Layered Navigation supports ajax loading page which makes all of the matching results visible instantly after apply attribute filter without reloading a whole page. 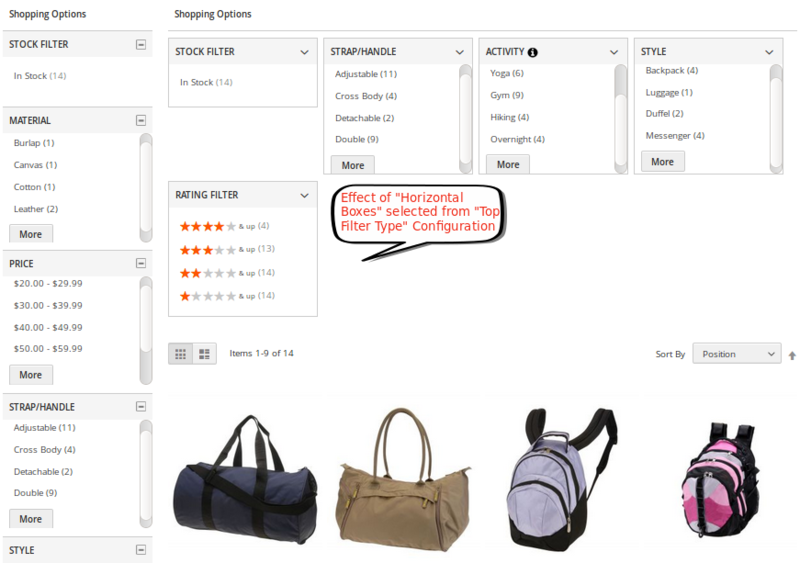 Using this extension you can add custom filter like Rating filter and Stock filter.You can display shop by brand section using widget. Layered Navigation supports Ajax Loading page which makes all of the matching results appear instantly after filtering any product attribute instead of reloading a whole page.So, it save time and improve site performance better. 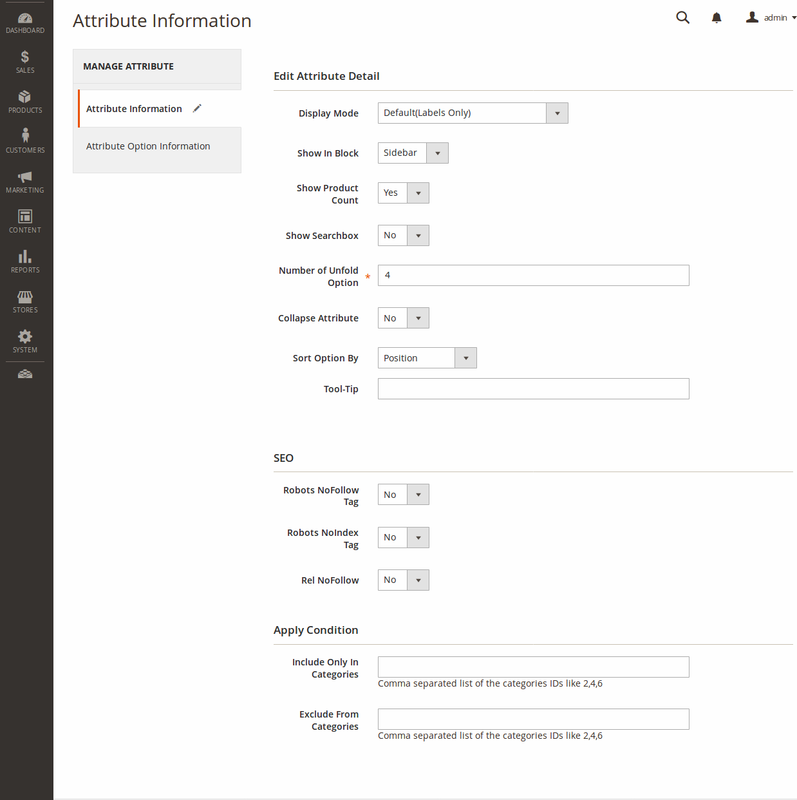 Each product attributes provides multi-choices and the customers are allowed to filter by one or more values at the same time. It will load results which is suitable with your options. 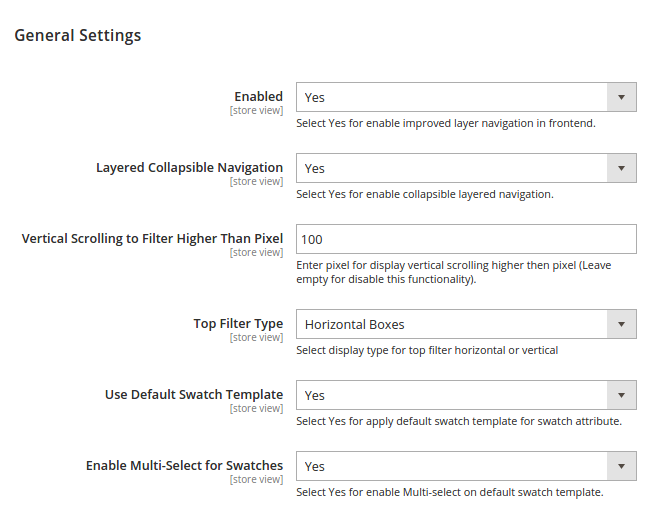 Show different filter types (sliders, radio buttons, checkboxes, dropdowns) in vertical or horizontal navigation menu.You can set vertical scrolling to filter higher than defined pixel.You can display Top filters in horizontal boxes and horizontal dropdown. 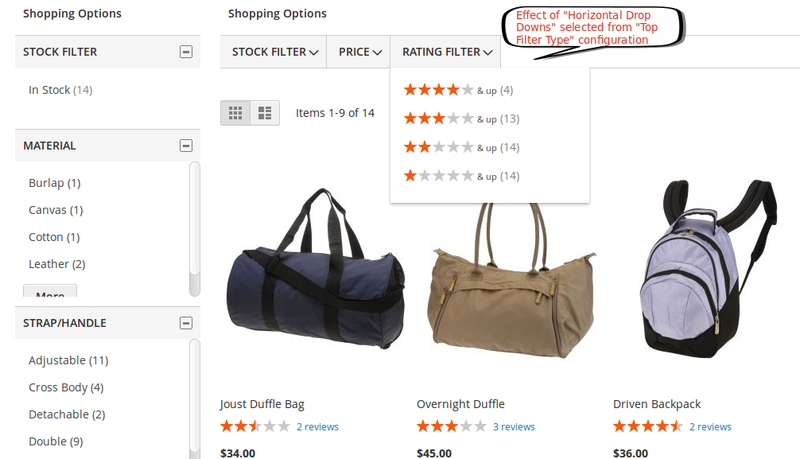 You can filter product collection by Ratings and Stock filter. 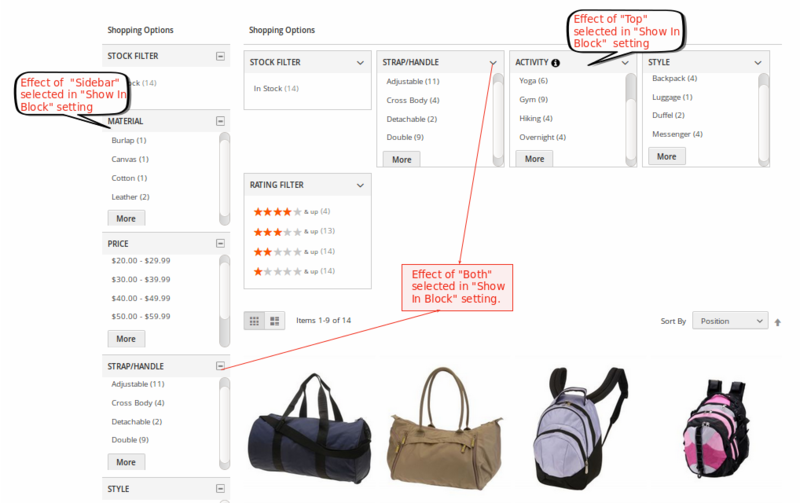 This feature will be a huge advantage in improving your store’s performance. 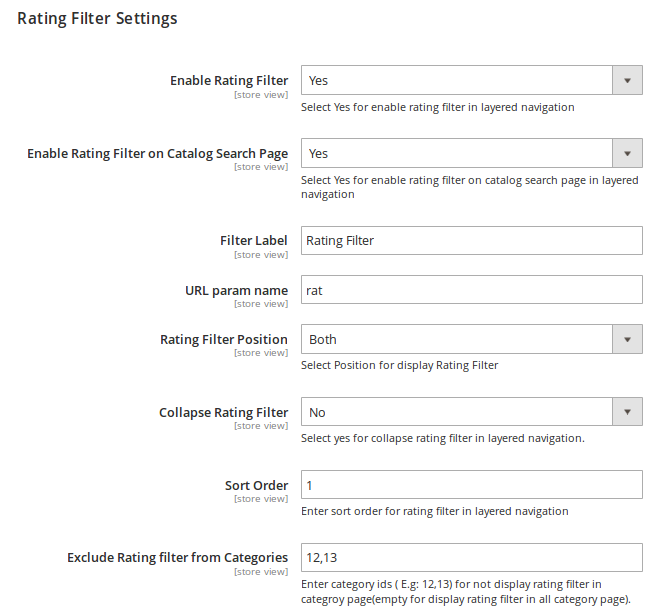 The rating attribute will be displayed and show multiple filter options follow each rating level. 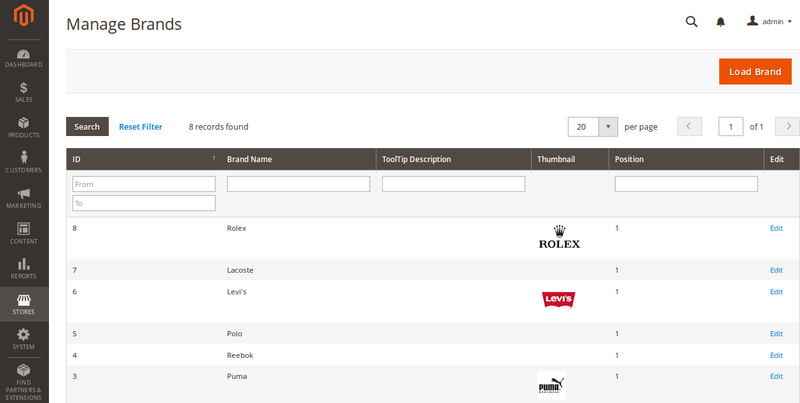 Customers can easily find their favorite brands.Create custom brand pages with unique content, enable brand filters with catchy logos, add brand sliders and 'all brand' list to any page using brand widget. Make your website much more SEO-friendly. Create short custom URLs for categories and brand pages. 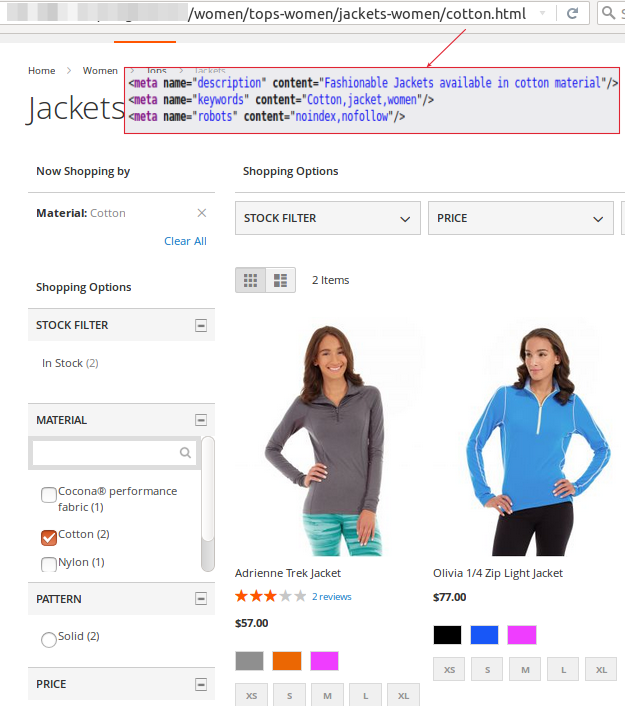 Specify custom meta tags for pages with selected attributes. Easily generate short SEO-friendly URLs for brand pages. E.g. 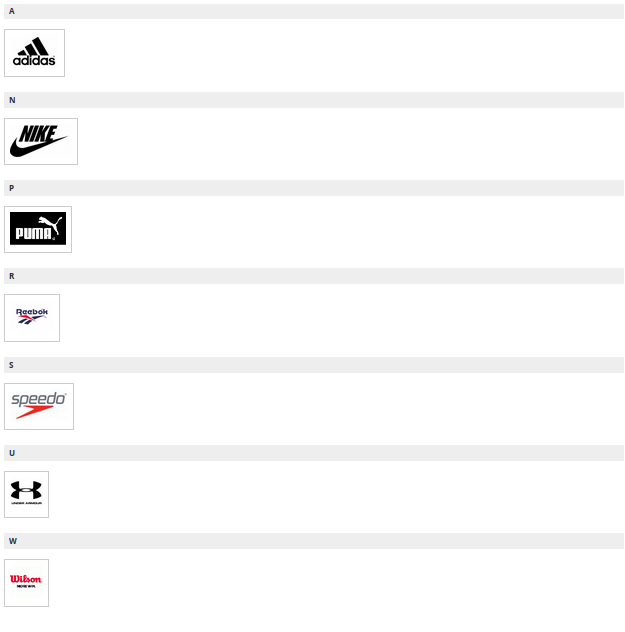 create URLs like yoursite.com/url-key/adidas.html. 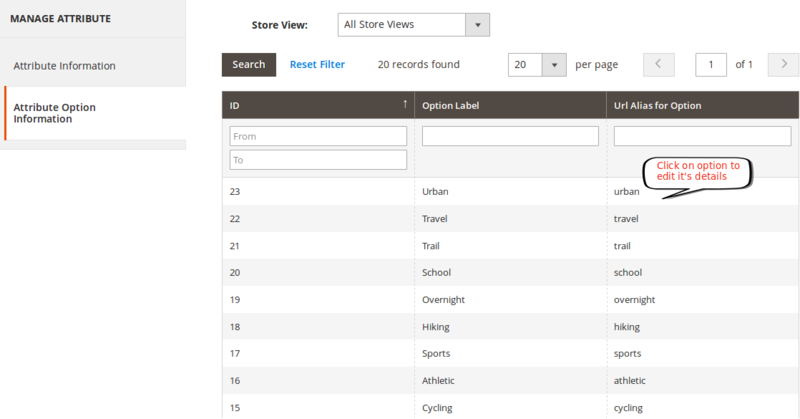 Specify any URL keys for pages with filter results regardless category or subcategory names. 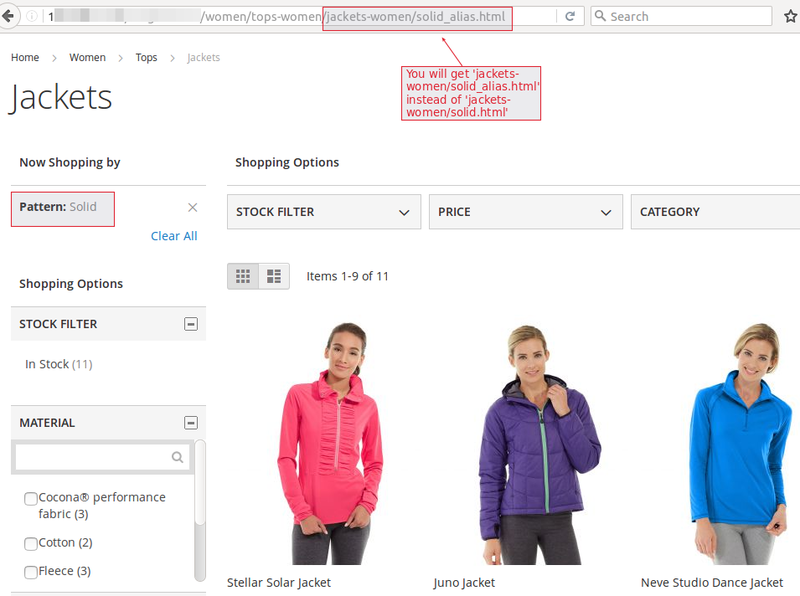 For example, you can set a custom URL alias for 'solid' to get "jackets-women/solid_alias.html" instead of "jackets-women/solid.html". 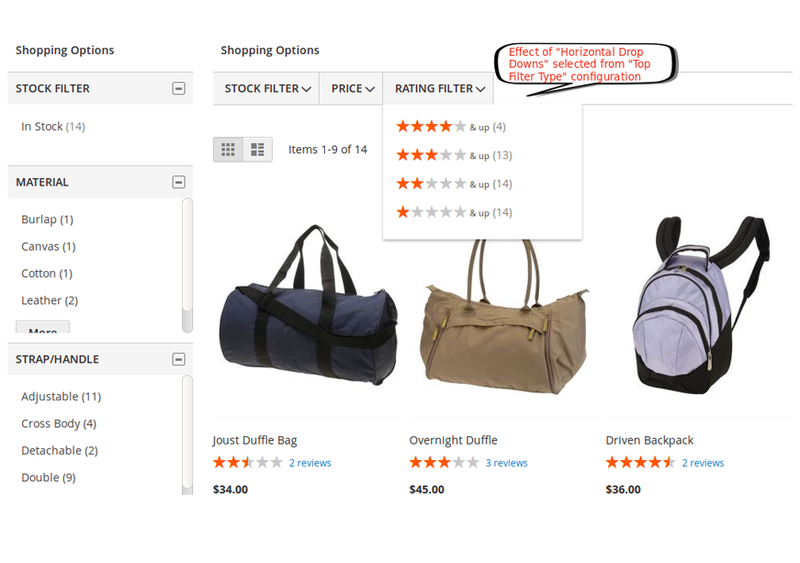 Enhance your store SEO by specifying custom meta data(meta title, meta description,meta keywords) for pages with filter results. 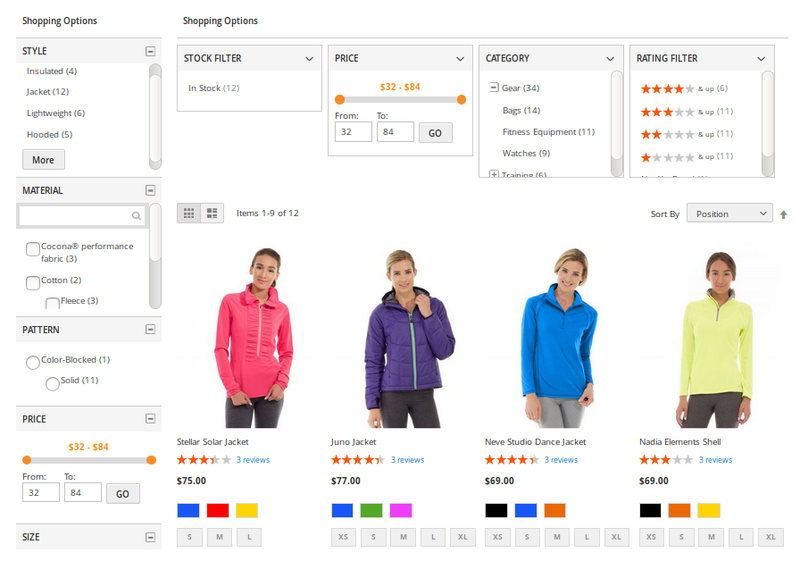 Automatically generated URLs for pages with filter results allow you to get "jackets-women/cotton.html" instead of "jackets-women.html?material=12"
We utilize the improved layered navigation pro by Magebees for our store and we have huge catalog so it helps our customer to find exact products using different filters. Outstanding job! Powerful extension for up stratified navigation with several capabilities. As invariably Magebees provides nice support and is continually up and adding new options for this extension. We use to work with Magebees extensions for long time. No doubts is a top Magento extensions developers with great developing knowledge and superb support. I have check many Improved Layered Navigation extension but this is the best M2 Improved Layered Navigation for features and price. Magebees offer awesome client support! Awesome support and great extension. I love the MageBees team! 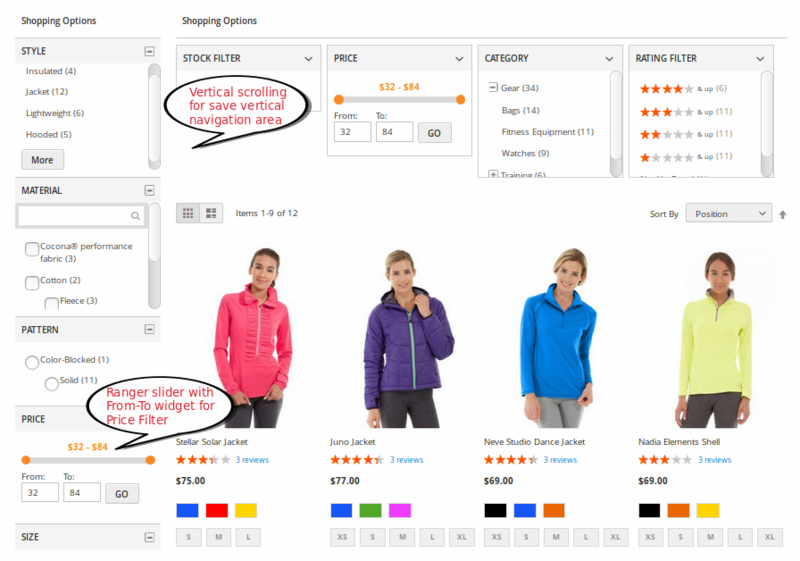 I’ve been using their plugin (Improved Layered Navigation Pro Extension For Magento 2). It’s well developed and user friendly. And when I do have an issue, they are always quick to respond and take all the time necessary to fix the problem. Awesome support and great extension. Thank you so much Magebees team! really appreciate your support. I need to thank the magebees group for this addon! It does all that I required. We utilize numerous filters on our site, every one of them are super-fast, exceptionally successful and look so pleasant on the frontend! I have bought this extension. Its working just perfect. Great extension and the support is also excellent !!. This extension makes the default layered navigation so much more quick and useful. 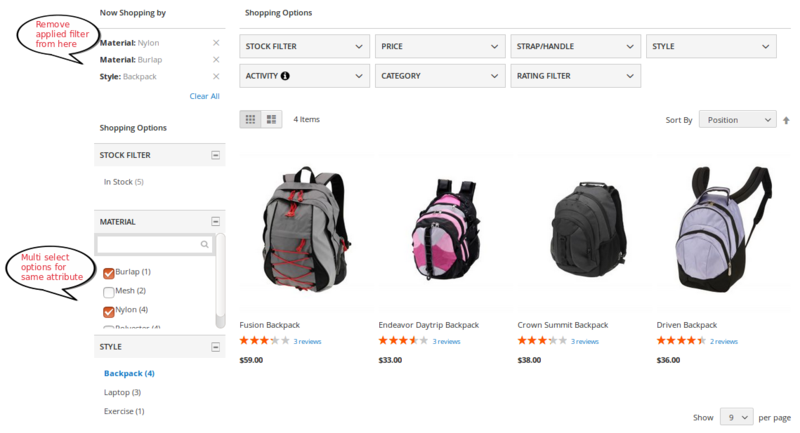 The navigation experience for our customers is so much better now. I am suggesting for this Layered navigation module. => Make Compatible With Our YMM Products Part Finder. Q-1: I have tried to install Improved layered navigation pro extension using terminal, but I am not able to install using command line, what are steps for custom installation of Improved layered navigation pro extension?? Ans : Please Contact us for install our module in your store . Q-2: I am getting error in console for layeredNav.js and layerbrandslider.js not found ,How to solve this problem ? 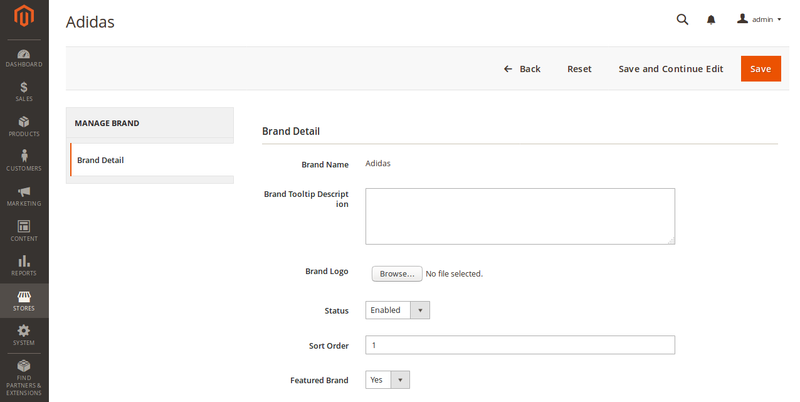 Ans : Please Click on "Load Brand" Button in Manage Brands Section and your updated attribute information will be show under manage brands grid. Q-4: When I click on "Load Brand" button in Manage Brands section it will show message something like this “There are no brand values available. Please insert values and then click on load brand button”? Ans : You will get this message only when you have not added attribute options value. 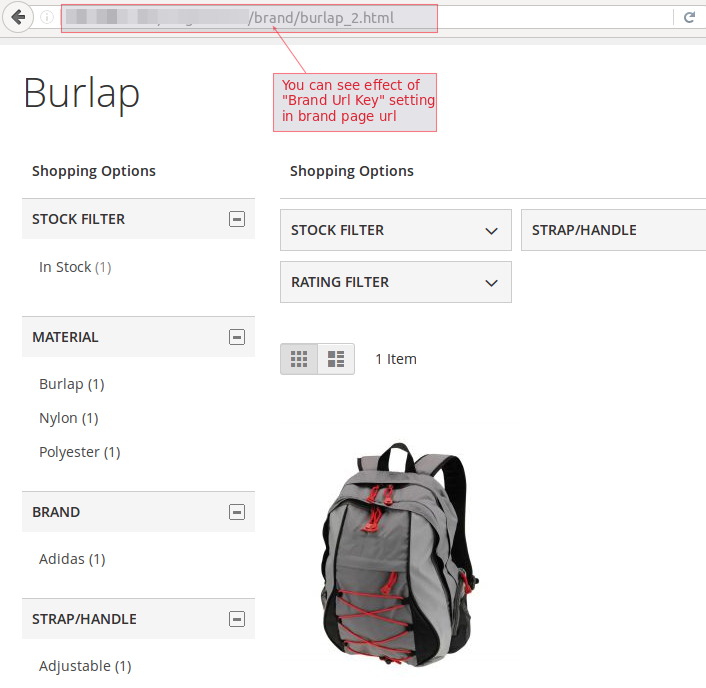 Once you added attribute options value from Backend -> STORES -> Attributes -> Product, once you set attribute option value then after click on "Load Brand" button,this message will not appear again. 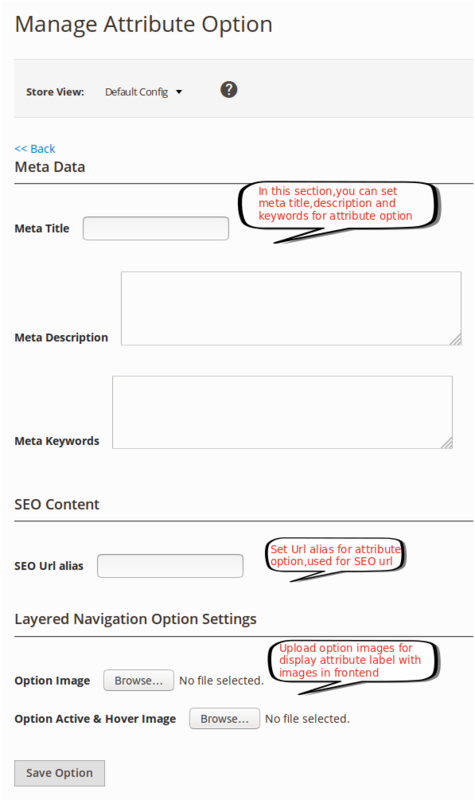 Q-5: I have set option alias from backend for seo url , but I am not able to see changes in frontend, how can I solve this problem ? If Cache Type “Magebees Improved Layered Navigation” is Enabled , then refresh the Cache Type. Q-6: While apply the filter in frontend , why I got the popup contain message like ‘Error while apply filter’? Ans : Please check below mention cases for failure of apply filter. 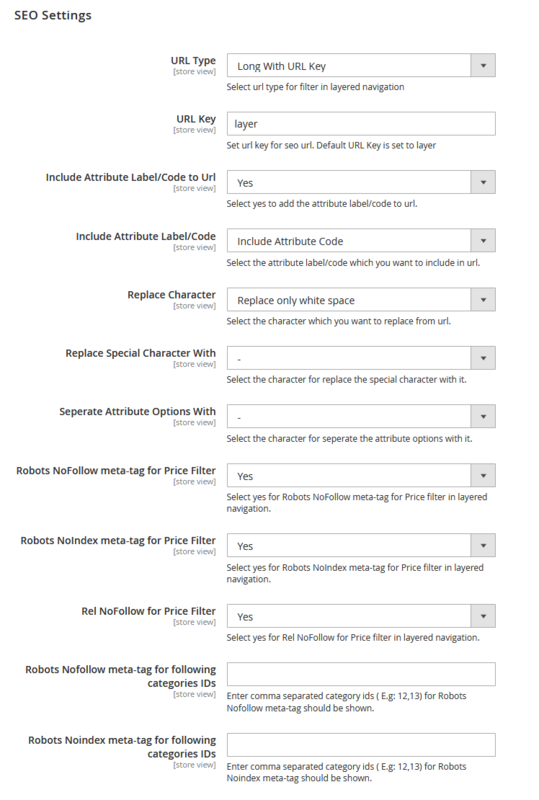 Please check if you have use same value for option separation and to replace special character then it may cause issue. If there are complex options like:"black-green", there will be a problem with single "black" and "green" options. In some cases such options will not be parsed by SEO URL router. If attribute option alias/value contain same name as attribute code/label then it also cause the issue while apply the filter with include the attribute code/label in seo url . As Example : If option alias/value “color-block” and attribute code “color” then if you have include the attribute code in seo url then it will not be parsed by SEO URL router and gives error.